Halcyon Style: Off to the Races! Today is the 137th running of the Kentucky Derby and, to me, might as well be a national holiday. My family's watched the race every year since I can remember and even choose horses for the win. Here's my strategy for choosing horses that has nothing to do with odds or pedigree: coloring and/or name. Some strategy, right? This may be why the last time I chose a winner was in 1989 when I was only four years old. 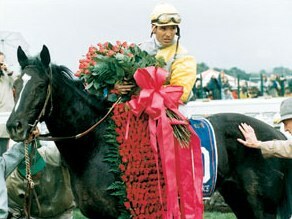 But, my four year old self used the aforementioned principles when I selected the black colt, Sunday Silence. I usually go for a black or grey runner because you tend to see more chestnut and brown thoroughbreds and I like to be able to tell my horse apart from the field. But every once in a while it's the name that gets you, like this year. My pick: Pants on Fire. Is this not the best name ever? 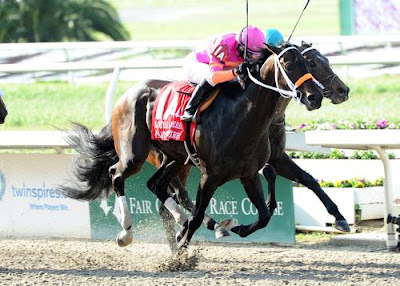 Check out his farm's racing silks: hot pink and orange! And, as an added bonus her jockey is a woman - this holds well with my feminist side. Of course you can always dress up at home too and throw a Derby Party for your friends and family. Don't forget to serve the original drink of the Kentucky Derby, the Mint Julep. Best of luck to Pants of Fire in today's race and of course prayers that all runner and jockeys cross the finish safe and sound!